Thankfully, Chuck Swindoll’s series, Excellence in Ministry: Finishing Well—Doing What’s Best in the Challenges of Ministry, is just the thing to help us navigate the difficulties of ministry. In this series, Chuck provides answers and instructions on confronting false teaching, maintaining a godly lifestyle, meeting the needs of people, and disciplining and encouraging leaders. Today, we live and minister amidst the crazies. And if you doubt it, just look around. This isn’t your father’s world anymore. So what are we to do? Bunch tightly in our holy huddles, hoping to keep the world at bay? Not on your life! Beginning in 1 Timothy 4:6 and continuing through the rest of the letter, Paul turns our attention to the one who seeks to be “a good servant of Christ Jesus,” namely, the minister. Paul starts off by outlining a list of dos and don’ts for effective ministry, focusing first on the pastor’s personal ministry and then on the pastor’s public ministry. How do we go about respecting and rebuking the saints? What is appropriate and what isn’t? Thank God He gave us 1 Timothy to answer these questions and serve as our guide. Just when we think Paul has exhausted all important topics, he comes up with one more—how the church ought to treat widows (1 Timothy 5:3-16). What he said might surprise us. It’s true that the Bible is filled with thou shalts and thou shalt nots, which serve as a sort of preventative checkup. But it’s also a book of “hints” rather than commands, kind of like when our mothers tell us when us when we have a cold to get plenty of rest and to eat your chicken noodle soup. Submitting to authority was just as difficult in the first century as in the 21st century, which makes 1 Timothy such a practical letter. So, let’s hear and heed Paul’s teaching on how to respond correctly to authority. If a pot of gold is found at the end of a rainbow, contentment is only found there if you bring it with you. And that’s the trick—to possess it, regardless of your possessions. To find contentment, let’s take into account some of Paul’s warnings on how we might miss contentment. It can be difficult to follow God’s clear commands. However, obedience doesn’t have to involve a grin-and-bear-it kind of attitude, not if we keep in mind that obedience is always for our good and God’s glory. Everyone who ministers, whether as a vocation or as a volunteer, is commanded to “guard what has been entrusted” (1 Timothy 6:20); it’s an essential part of ministry. Because churches are populated and pastored by imperfect people, we should stop every once in a while to administer an examination against the standard of God’s Word. 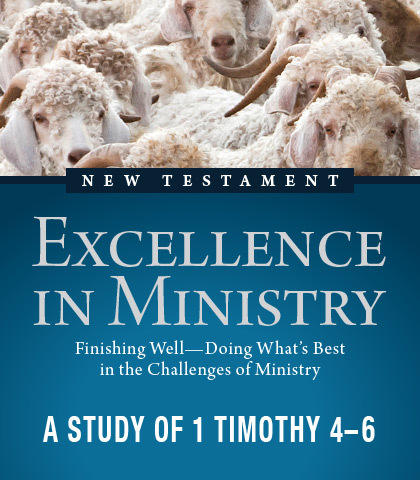 As we close our study of 1 Timothy, let’s do that—let’s evaluate your ministry.